5 Best Egg Turners Review 2019: Which You Should Consider Before Buying? If you own a poultry business and have been incubating eggs and hatching them, you will already be aware that turning eggs manually can be quite a tedious process. Eggs in the incubation phase need to be turned once every four hours, and that can mean quite a bit of effort. Not only will you always be at the clock’s mercy, but you will also have to ensure that you are always delicate and gentle with your eggs. Egg Turners can take a headache out of this process. An Egg Turner is a device that automatically turns the eggs or rocks them and turns them from one side to the other. The reason why eggs need to be turned is so that the embryo inside the egg does not end up sticking to the shell. An advantage that Egg Turners have over manual handling is that the risk associated with turning eggs by hand is a lot higher. There is a chance of inadvertently damaging the eggs. Egg Turners, since they are automatic, gently rock eggs to turn them from side to side thus minimizing the risk of harm. Egg Turners can be inbuilt within an incubator itself, or you can separately purchase a Turner to automate the process of turning the eggs. If you are considering purchasing an Egg Turner, and it is recommended that you do, you should check out the top 5 Egg Turners available in the market. They have been listed below with their primary features, what makes them a great buy and how much money you can be expected to shell out. This automatic Egg Turner from Incubator Warehouse fits all types of HovaBator Incubators. It can hold up to 28 goose eggs, 42 chicken eggs or 70 eggs of quail. Because of its universal design, the IncuTurn Automatic Egg Turner can hold eggs of any size, which means that the headache of having to buy more Turners with different cup sizes will not be required. The IncuTurn Automatic Egg Turner turns eggs by rolling them to mimic the natural way in which eggs are turned. It is a reasonably priced Turner and is the number one on our list of recommendations. This Egg Turner is manufactured by GQF and sold by Authentic Wares on Amazon. It is fully automatic. The Turner consists of six racks and can hold up to 41 eggs at a time. The racks can hold eggs of any size from the egg of a partridge to duck eggs. In addition to this, additional racks are also included for quail eggs and can hold a total of 120 quail eggs. These Egg Turners can be used along with Hova-Bator incubators. The HovaBator Incubator Automatic Egg Turner is one of the more expensive Egg Turners in the market and ranks second on our list. If you are using a Farm Innovators Incubator of any of these makes – 2100, 2150, 2200, and 2250 – the Farm Innovators Model 3200 Automatic Egg Turner is an ideal Turner for your use as it works seamlessly with all these incubators. This Egg Turner turns the eggs automatically every four hours. The egg racks can be snapped out of the Turner very easily so that you can clean them. The unit is absolutely dishwasher safe. 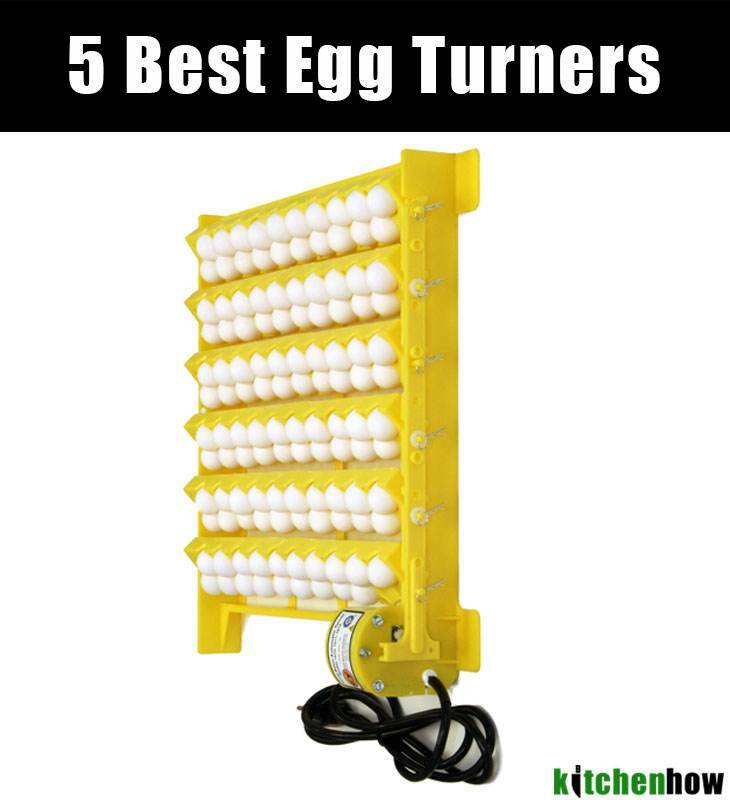 This Egg Turner has a capacity of 41 large eggs. However, should you need it, small quail egg trays are also available as an option for purchase. The Farm Innovators Model 3200 Automatic Egg Turner is a higher priced Egg Turner, but its features make it worth the price. Sold by Little Giant Farm & Ag, this Egg Turner is made from high-quality materials and very easy to operate, clean and maintain. It requires no assembly and is fully automatic. It can hold a maximum of 41 large eggs at a time. This Egg Turner comes from a well-reputed international distributor of farm, ranch and poultry products who has been the industry leader for 69 years and is made in the U.S.A.
Little Giant Farm & Ag Miller Manufacturing 6300 Automatic Egg Turner is a reasonably priced product. The automatic Egg Turner from Harris Farms is another great product to consider. It can hold up to 41 eggs and rotates the eggs once every four hours. The unit does not require any assembly. Also, this Egg Turner is dishwasher safe. It can be used with Harris Farms Still Air Incubators by placing it at the bottom of the incubator and plugging it in a power outlet of 110 V.
If you are looking for an inexpensive Egg Turner, then Harris Farms Automatic Egg Turner is worth a buy.